My previous post had some unique and moderately interesting data on Facebook. It was picked up by Techcrunch who posted a short story with a link. Now, less than a week later, Googling the URL of my post gets no less than 70k results. Googling “Benedict Evans” with the ‘in the last week’ filter gets 38k results. That discrepancy is probably an artefact of Google’s caching mechanisms, but even so, that’s a lot of links. So what was the click through? This chart shows the Google Analytics data for daily uniques. 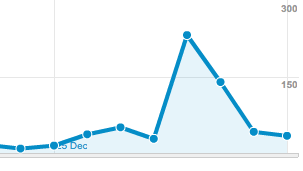 Now, what does that say about the likely quality of the tens of thousands of sites that copied that Techcrunch story? It looks like content farms haven’t died down just yet. John sent over 6k uniques in 3 days with a passing reference. As the Americans say, go figure.